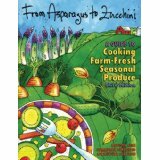 From Asparagus to Zucchini, 3rd Ed. Toast cashews in a dry skillet, tossing frequently, until lightly browned and fragrant. Combine cashews, vinegar, sugar, soy sace, ginger, red pepper flakes, and 2-4 TB water in a blender or food processor; puree until smooth. Set aside. Wash bok choy stems and leaves well, making sure to rinse away dirt in the ribs. Separate the bok choy leaves from the stalks. Cut stalks into 1-in pieces and roughly chop the leaves. Add the leaves and cook until they wilt and turn bright green, another minute or so. Remove to a platter and cover with cashew sauce, or serve sauce on the side.